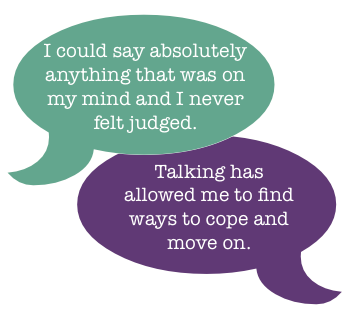 Counselling allows you to talk about your problems and feelings in a safe supportive and private space. 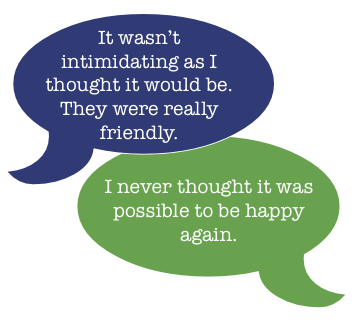 People choose to have counselling because they could be experiencing difficulties and distress in their lives or have other problems which they need to talk over in private. It may be easier to talk about personal, family, or relationship issues with a person who is independent of friends and family. Counselling to helps you to cope with and overcome issues that are causing pain or making you feel uncomfortable. It can provide a safe and regular space for you to talk and explore difficult feelings. The counsellor is there to support you and respect your views. Counselling can often involve exploring difficult or painful feelings and, as you begin to face them, with the help and support, you should gradually start to feel better. A counsellor will not judge you or give you direct advice, but will help you explore alternatives so you can make your own choices. “I felt I had more control over things”….… “I found it helped reading back the replies”… “I didn’t have to explain where I was going”…..…”I didn’t want anyone to know I was getting counselling”…… “ I’m not sure if I would’ve opened up so much if I was sitting with someone there”…..”I wanted to try some counselling”… “ I just needed someone to talk to during the holidays when I couldn’t see my counsellor”. Sometimes you can feel isolated but at other times, even where an you have the most supportive family and friends, you can find it difficult to explain why you are feeling anxious or depressed. You do not have to be in crisis or on the verge of one, before choosing to have counselling.